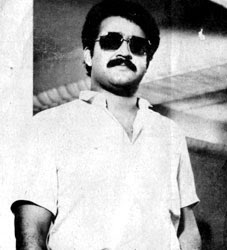 MohanLal's first film was Thiranottam in 1978.The film ran into trouble with the Censor Board and was never released.His breakthrough came in 1980, at the age of 20, when he was selected for the role of the antagonist, in Manjil Virinja Pookkal. He had no dearth of opportunities after this and he played roles of gradually increasing importance in a number of movies in the following years. In the year 1983, he was credited in more than 25 feature films. Uyarangalil, a story of cheating and deception, written by noted script-writer M. T. Vasudevan Nair and directed by I. V. Sasi was the highlight of this period. In the film he has a strong villian role.He then expanded into comic roles in his director-friend and college mate Priyadarshan's debut Poochakkoru Mookkuthi. The period is widely regarded as the golden age of Malayalam cinema with films characterised by detailed screenplays, lucid narration and fresh ideas narrowing the gap between art and commercial films.1986 was one of his best years. Sathyan Anthikkad's T.P. Balagopalan M.A. got him his first Kerala State award for best actor. His role of an underworld don in Rajavinte Makan saw the emergence of Mohanlal as one of the leading stars of Malayalam cinema along with Mammootty. In the same year, he played an asylum outmate in Thalavattam, a harassed house-owner in Sanmanassu Ullavarku Samadhanam, a journalist in M. T. Vasudevan Nair's Panchagni, a farm owner in love in Namukku Parkkan Munthiri Thoppukal and an unemployed youth forced to become a Goorkha in Gandhi Nagar 2nd street.Th above films are the turning point of his career. At his peak, he portrayed some of the best roles in Malayalam cinema in movies by Padmarajan and Bharathan. Thoovanathumbikal in which he portrayed a person torn between his twin love interests, broke many stereotypes in Indian films such as the leading man falling in love with a second woman immediately after he is rejected by the first. Amrithamgamaya was about a man who ends up at the house of a boy whom he had unknowingly killed in college during a ragging session. Another notable film of this period was Thazhvaram. Lalettan's one of the famous role,Sethu Madhavan, who dreams of becoming a police officer but ends up as a criminal in the film Kireedamearned him a Special Jury Award. Another role of a classical singer who is burdened by the jealousy and final death of his singer brother inBharatham helped him bag the Best actor award the following year. One of the evertime Box Office Hits of Mollywood Manichitrathazhu, which had the female lead Shobhana ragging a National award for best actress.These success established Mohanlal as the most popular actor ever in Kerala and one among in india. Movies like Aaram Thamburan,Ravanaprabhu,Narasimham, Naran used the popularity image of Mohanlal to great effect and became blockbusters. After their initial novelty, these films faced criticism from many quarters over their lack of realism and for creating movies around Mohanlal. Priyadarshan's Kalapani, an account of India's freedom struggle against the British that focused on the Cellular prisons of Andaman islands and Lohithadas's Kanmadam were some of his notable films during the late 90's. In 1997 Mohanlal's film Guru which based on communalism in kerala,directed by Rajiv Anchal was selected by the Government of India as official entry for Academy Award for Best Foreign Language Film. Mohanlal getting noticed outside the mollywood at these time.He acted in his first non-Malayalam movie when popular director Mani Ratnam roped him in for the Tamil filmIruvar. It had Mohanlal playing MGR, a cult figure in the neighbouring Tamil Nadu. The Indo-French production, Vaanaprastham, in which he played the role of a Kathakali dance artist with an identity crisis, won him the second National award for Best actor and was the first film that got him international recognition. The film was selected for the competitive section at the Cannes film festival and his performance was critically acclaimed. In 2002, Mohanlal acted in his first Bollywood movie, Company, which introduced him to the wider Hindi speaking audience in India. It was a critical and commercial hit.In 2006, the film Thanmathra,won him the Kerala state award for best actor for portraying a person affected by Alzheimer's disease. His second Bollywood movie Ram Gopal Varma Ki Aag, was the remake of the 1975 blockbuster movie Sholay, in which he played the character of the inspector played by Sanjeev Kumar in the original. Mohanlal won the 2007 Kerala state award for Best Actor for his performance as Valiakathu Moosa in the movie Paradesi.Mohanlal completed 30 years in the film industry on 3 September 2008. His other notable movies are Agnidevan,Oru Yathramozhi,Harikrishnans,Ustaad,Devadoothan, Kakkakuyil,Balettan,Udayananu Tharam,Chandrolsavam,Rasathanthram,Kirtichakra,Chotta Mumbai,Hallo,Innathe Chinthavishayam,Mizhikal Sakshi,Madampi,Aakasha Gopuram, Kurukshetra,Pakal Nakshathrangal.In 2008, Mohanlal starred in the mega movie Twenty:20 which cast all the prominent actors of Malayalam film industry. On the release of the movie in November 08, controversy was triggered by Mohanlal fans accusing that Mohanlal was not given prime position in movie's posters where he appears slightly behind rival Mammootty. Despite the controversy, movie started with huge initial collection and good reviews. He was awarded the territorial army Honour Lt. Col by the Government of India this year for his excellent performance in keerthichakra and kurukshetra. The much expencive movie in His carrer’s and in Malayalam film industry “CASANOVA” is the first hit of 2012. This movie face several critics reviews about the age of Mohanlal, but the collection reports and performance of mohanlal remove all the controversies and rumors. In 2012 he has many projects.Three films are released already and them get a great position in boxoffice, they are ”CASANOVA,GRAND MASTER, SPIRIT”. And the upcoming movie is RUN BABY RUN, directed by Joshy will most probably hit the theatres in August- 29 , 2012.Other projects are Nairsan,Che Guevera,Cousins,Hallo Mayavi…and a number of films whose name is not fixed yet.